Finally, I will post a photo for SkyWatch Friday before Friday is over!!!!!! It is a bit fuzzy (at least that is how I see it) but I just love the colors......it was hurriedly taken with my trusty phone camera. 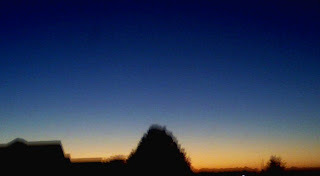 For more lovely skies go to http://skyley.blogspot.com/. Hey, my posts have been so sporadic lately, be sure to scroll down to read Apollo's latest angst tale (tail?) posted late Thursday. fuzzy or not, it's great. THis time of year these are the best of colors. How is Apollo doing now? those colors are gorgeous!! don't you just love sunsets like that? i want to just bottle them so i can see then whenever i want. have a nice weekend! Hey Cris, Apollo is a bit better but he still is doing that funny breathing thing from time to time, think it is sinus, all of ours are worse also. The steroid is making him wee alot and drink more water, he had went in his crate this morning - really, really odd. Guess it will take a bit of time. Thanks for asking!